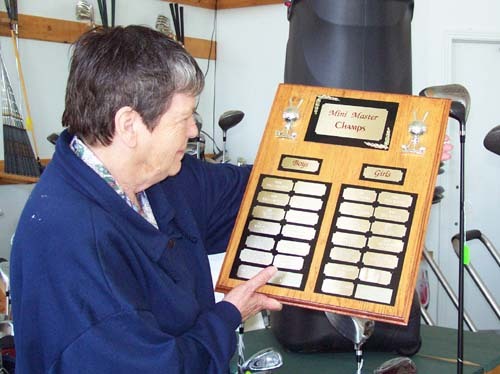 Capreol Days 2006 is history now, but the memories will linger on for many years. Gary Biesinger and the staff and columnists of Capreol Online have assembled some photos and results of various activities of the weekend. We would encourage you to visit Capreol Online through the link below to find out all about Capreol Days. 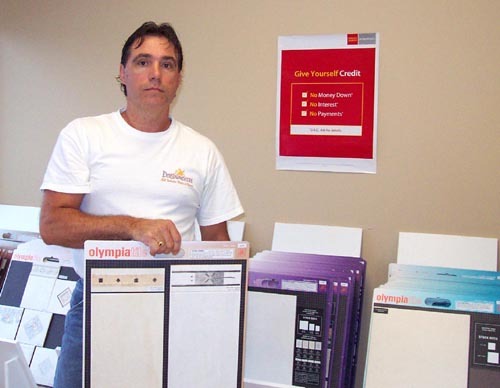 You will also enjoy visiting Capreol Online for the vast wealth of information and knowledge that Gary has assembled about this great community. Enjoy your visit. Real Carre, Director of Leisure, community and volunteer services has explained that the removal of local playground equipment during the middle of summer vacation is for the safety and well-being of the Greater Sudbury community. 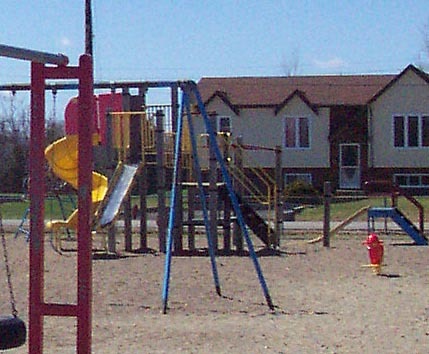 He added that the City is beginning to completely replace or partially retrofit aging playgrounds that no longer meet Canadian Standards Association guidelines. The photos above and below show that the Valley Acres playground was one of those facilities that lost a major piece of equipment earlier this spring. It has not been replaced yet, so neighbourhood children have lost out on many days of holiday enjoyment. This has not sat well with parents of the area. 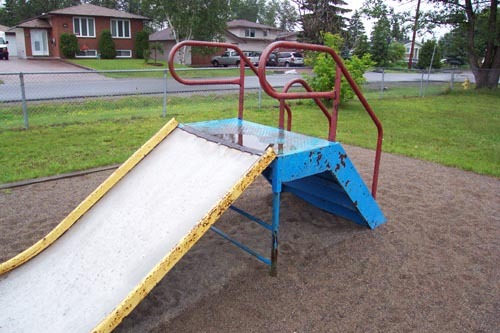 Close to 30 playgrounds throughout the City of Greater Sudbury have had equipment removed this year. Apparently, a playground practitioner (whatever that is) was hired this spring to create an inventory of playground equipment and report back to the department of leisure services. Equipment that did not meet Canadian Standards was removed. Tenders were put out on July 21, with City Council expected to approve the process on August 10. 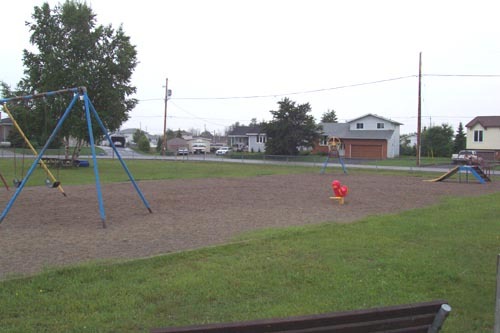 Council approved an expenditure of $750,000 in January for the upgrading of playgrounds, but the procedures in place require further approval of the tendering process. If Council approves the expenditure for the new equipment, it will be ordered and installed sometime in late September or early October, just in time to be covered up with snow. Many local residents in the Valley Acres subdivision, as well as in the area around Elmview Playground are fuming at the loss of equipment and the subsequent discovery that nothing has been done to replace it in a timely manner. Some parents are claiming that there is nothing wrong with the equipment in the first place. Some welding and fresh paint would have done the job just fine and given children a place to play all summer. Others are extremely upset that the City is using the "safety excuse" with playground equipment. One mother was quoted as saying, "Just look at the rust that is all over the playground equipment. If they are so worried about safety, then why don't they get a can of paint and fix the equipment that is left here. My children are more likely to get injured by a piece of rust than from faulty equipment." One young father used very forceful language to state what he thought about the "safety line" being used by the City. "They say they are so concerned about the safety of the children then they build a skateboard park in Minnow Lake and allow kids to risk head injuries because they are not forced to wear equipment. Give me a break!" Carre admitted that the City should have informed local residents prior to removing the equipment. As a result, the city will be sending flyers to residents who live within a kilometre of the affected parks to explain why the equipment was removed and when it will be replaced. While that may please some people, others are pointing to this as another example of what is wrong with the current system. As one observer stated, "First of all they hire a consultant to do an inventory of the playground equipment when we have all kinds of staff in the leisure department. Then they take out the equipment at the beginning of the summer and don't plan on replacing it until October. Then they leave all of the rest of the equipment covered in rust to deteriorate so that it will have to be replaced next year. What are they thinking?" 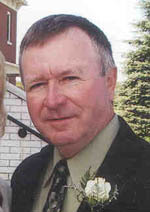 Robert Kirwan, one of the Candidates for Council of Ward 6, Hanmer and Val Therese, had several comments to make on the matter. "Our local playgrounds should be the heart of their neighbourhood. When people with children are deciding on a place to live, they don't just look for a house. They look at the recreational facilities, the schools, the day care centers and the retail outlets. Then they choose a home that will be central to the needs of a growing family. When they travel around Valley East they see playgrounds with rusty equipment, long grass, gravel on the pavement, graffiti on the walls and gaping holes where equipment has been removed. 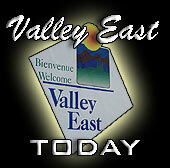 Despite all of this, Valley East is still booming. Imagine how things will be once we force the City to pay serious attention to our playgrounds and the conditions of our community." Community Groups and Organizations can now book space at the Hanmer Valley Shopping Centre by calling 524-7006. Whether You Are Buying a Newly Built House or a Previously Owned House, It Is Always A Good Time To Check Out Flooring Options Before You Move In! "This is the first time I've ever won anything in my life," explained a happy Linda Tessier as she received her package of gift certificates from Robert Kirwan, Director of Marketing & Public Relations for the Hanmer Valley Shopping Centre. Linda was the winner of the July Customer Appreciation Contest which is sponsored by mall merchants. She received a total of over $1500 in gift certificates and coupons which can be used by either herself or any of her family and friends to whom she wishes to distribute any she cannot use herself. Shoppers are invited to enter the contest each time they make a purchase at the mall. All they have to do is place their name and phone number on the back of their cash register receipt or fill out one of the ballots available in front of Desjardins' Food Basics or Billie Jeans. 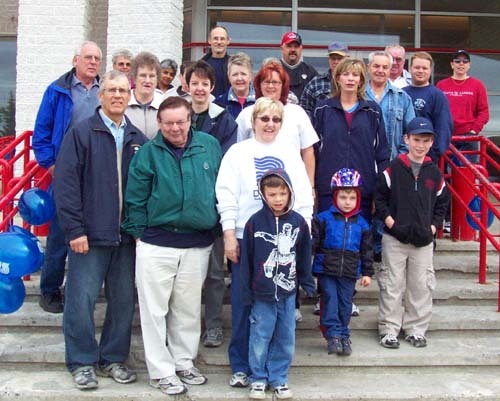 Although our numbers were small, our Walk and Wheel for Dystonia Medical Research was a success. With 35 participants, including MPP Shelley Martel, we raised just over $5600 and we hope to receive some extra money from Wal-Mart. It was a cool day but great for walking. We had lots of door prizes and with our small numbers everyone went home with a prize. Thank you to LInda Thompson, who organized the BBQ; Len Shymkiw for doing the cooking, and to the merchants who supplied the food...Desjardins' Food Basics (Hanmer Valley Shopping Centre); Loebs (Val Caron); Neil's YIG (Hanmer); Marche Richelieu (Hanmer; and Tim Horton's (Hanmer). Special thanks to all the retailers who donated door prizes: Plaza 69 Pharmacy, John Ellis IDA, Staples, Ray Bonin (Canadian Flaga), Chapters, M&M Meats, Rusty Cellars, Toppers Pizza, Scotiabank, Barrydowne Paint & Wallpaper, Wal-Mart, Buddies' Restaurant, Grand & Toy, Chico's Bowl & Sports Lounge, Dorothy Pearsall, and Mary Guy. We also made the front page of the Sudbury Star with a wonderful article about Dwayne Backer, who raised an amazing $1937.75 for the cause. Keith Lacey from the Northern Life also did an article for us about dystonia and Bob Kirwan showed up to take pictures at our walk so we look forward to seeing them either in the Vision newspaper or on his web site at www.valleyeasttoday.ca. With all this coverage, many more people should be aware of this illness called dystonia. With the help of all these wonderful people our walk was a great success.